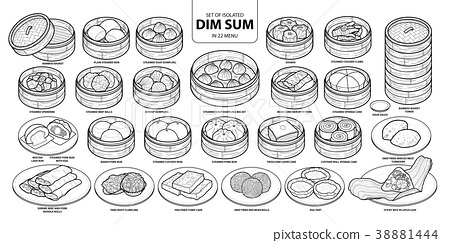 Set of isolated Chinese food, Dim Sum in 22 menu. 图库插图: Set of isolated Chinese food, Dim Sum in 22 menu. Set of isolated Chinese food, Dim Sum in 22 menu. Cute hand drawn food vector illustration in black outline and white plane on white background.